As familiar as I am with Greek and Roman mythology, I know absolutely nothing about Egyptian mythology. And when I say absolutely nothing, I do mean exactly that. I don't even know who the gods and goddesses are, I most definitely have no idea about their character traits, and the stories themselves are not the least bit familiar. So yeah, believe me when I say that I am in no way being modest of my knowledge of Egyptian mythology. I honest to goodness had no idea what I was getting myself into when I picked up this book. While I was reading the Percy Jackson series by Rick Riordan, there was always a hint of recognition whenever a new mythological being was introduced, but for this book... nada. And you know what? I liked the feeling. I liked the fact that I had no idea who the characters were. Simply put, I liked not knowing what to expect. I consider The Chaos of Stars a refreshing read. As a whole, I feel like the book did a very good job of introducing Egyptian mythology to new readers and weaving the mythos into present day. While it was true that I didn't recognize any of the characters' names when I first read them, White wrote the book in such a way that readers would be aware of the more important stories of Egyptian mythology without distracting them from the main plot of the book. So again, I stress that even if this is your first time seeing all these names and whatnot, you have no reason to worry. You'll get to experience the mythology at a well thought out and balanced pace. 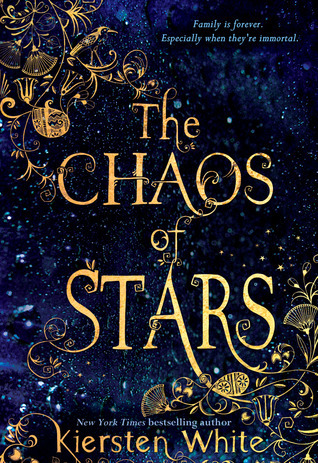 As much as I enjoyed the book's background and the story itself, I did have my fair share of misgivings with The Chaos of Stars. While not a particularly dark novel, it took me longer than usual to finish it, and I'd have to attribute this fact to the main character, Isadora. To be perfectly honest, Isadora is one heck of a difficult character to read about. I actually had to stop reading once every few chapters because I swear her negativity was just seeping into me! She was just so angry, so negative, and so eager to think the worst of anything and anyone all the time. Let me be clear - I do get where she is coming from. I understand why Isadora hasn't let go of the pain and hurt, and why she is angry at her parents. I understand her disdain towards her filial background, and her desire to simply be Isadora, and not Isadora, the daughter of Isis. I understand her burning need to just go out and do something without the shadow of her ancestry looming at her every step. However, I can't and won't deny that eight times out of ten I found her completely unreasonable. Things would have been so much simpler if she just sat down and actually talked to her mother. Then again, I supposed that every child has felt that he or she can't talk to his or her parents. Isadora has made that clear oh so many times, and I remember feeling that way a handful of times too. I remember feeling betrayed, and thinking that my parents can't possibly understand me whatever I do. I remember feeling completely alone, and yearning to just go somewhere far far away. So yes, while I most definitely didn't like Isadora for the most part, I can't find it in myself to hate her. Heck, sometimes, I even found myself relating to her! Moreover, I do appreciate the fact that White took the time to develop Isadora's character, and to ultimately allow her to mature. The character development wasn't instantaneous, but rather slow and subtle. Isadora at the end of the book as opposed to the beginning were almost completely two different people, and I can't wait to find out how this new Isadora will go forth her next adventures in the next books! All in all, I did enjoy The Chaos of Stars. While I wish that the story itself was more fast-paced, I still believe that this take on mythology made for an entertaining read, as well as the budding relationship between Isadora and Ry. It's not insta-love (though it really seemed like that at first), and I just love how supportive and understanding Ry was of Isadora. I'm not exactly sure what the next book in the series has in store for us, but hopefully, we get more of Ry's background, as well as scenes of Isadora (finally!) communicating with her parents!